Process starts with the bug tracker. Either an existing bug is selected by the contributor, or one is specifically created by the contributor. Optionally, the contributor can already discuss the (sketched) contribution, or even just the path to make a contribution, with the lead designer(s) and other helpful designers, users and developers via the usual channels (irc, mailing list, etc.). The contributor sets off the process by attaching the interaction design contribution to the bug. There are quite a few requirements this contribution has to adhere to. does not have to be perfect; the lead designer(s) will help out with tips, guidance and instructions, and a tweak or two to the contribution (see below)—but to be clear: the contributor has to do the work to get the contribution into an acceptable state. After the interaction design contribution had been attached it can be publicly discussed, in the bug tracker, the developer mailing list and on irc. if the patch nowhere near matches the requirements, the lead designer(s) reject it; they may comment the bug with some global direction that can guide potential contributors to submitting a more successful contribution. 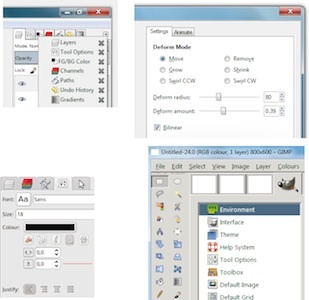 When the number of high quality contributions has become sufficiently high, the new contributor is granted access by the lead designer(s) to the interaction design repository, gui.gimp.org, to directly integrate contributions. This section states the interaction design issue/enhancement you are trying to solve. It does not have to be long, as long as it is clear. Maybe two paragraphs are enough. Please do not state this as an issue you have, interaction designers take themselves out of the equation. State the issue as it is for one million GIMP users and relate it back to the product vision. If you are able to put in some analysis what causes the issue, that would be good. iteration: standard interaction design practices predict that you will have to iterate your drawings, meaning starting from scratch and draw everything again; doing this four times is a low number of iterations; yes, this also happens to the most seasoned pro, it is the way we roll. pixel drawings, really not recommended. But as long as you are prepared to do the iterations and we cannot see the difference with vector drawings, you are welcome to use them. Below are some snippets of pixel drawings that are not wireframes. They do not comply with the requirements for platform and theme independence. If you sent us something like this, we will kindly ask you to redo your drawings as wireframes. The final ingredient. The descriptions here complement the drawings and fill all the holes (see the requirements). Describes behaviour, logical algorithms, etc. If it makes things clearer, you can mix them with the drawings (instead of keeping them as a separate section). when some interaction has been implemented, but not designed, it will be redesigned later. if you can implement your own interaction design patch, you have just significantly increased the chances it will. This is an objective description of an open source code contribution process, specifically for new, fresh contributors to the project. It is specific for the GIMP project. Optionally, the contributor can already discuss the (prototype) contribution, or even just the path to make a contribution, with the maintainer(s) and other helpful developers via the usual channels (irc, mailing list, etc.). The contributor sets off the process by attaching the code contribution to the bug. There are quite a few (un)written requirements this contribution has to adhere to. does not have to be perfect; the maintainer(s) will help out with tips, guidance and instructions, and a tweak or two to the contribution (see below)—but to be clear: the contributor has to do the work to get the contribution into an acceptable state. After the code contribution had been attached it can be publicly discussed, in the bug tracker, the developer mailing list and on irc. if the patch nowhere near matches the requirements, the maintainer(s) reject it; they may comment the bug with some global direction that can guide potential contributors to submitting a more successful contribution. When the number of high quality contributions has become sufficiently high, the new contributor is granted access by the maintainer(s) to the code repository, to directly integrate contributions. This page was last modified on 5 June 2012, at 16:41.